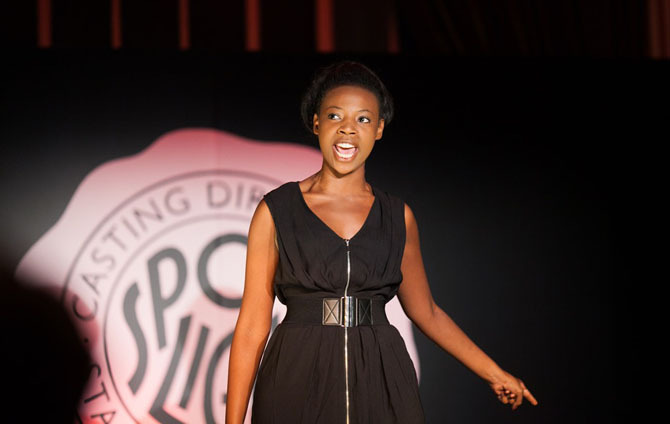 Congratulations to Mimi Ndiweni, who graduated earlier this year, on winning the 2013 Spotlight Prize and joining a prestigious list of previous winners including Dame Judi Dench, Albert Finney, Jim Broadbent, Zoe Wanamaker, and Robert Lindsay. Mimi’s performance of Jenna Marbles’ How to Get Guys to Leave You Alone scooped the £2,000 prize, which is contested annually by graduating actors from 21 of the UK’s leading drama schools. Each performer has three minutes to perform a piece in front of the panel, which this year included Rebecca Front (The Thick of It, Grandma’s House), Samuel West (Mr Selfridge, The Chronicles of Narnia), Kenneth Cranham (Hot Fuzz, Layer Cake), and casting directors Alastair Coomer, Debbie McWilliams and Gary Davy. “Ndiweni proves instinctively that simple and straightforward can be best and proves it emphatically.” said The Stage.